For a Sunday morning, I was surprised how quiet the Mitte area of Berlin was. Streets were empty and everything seemed closed until I found Factory Girl!. As I found out later, Berlin was a quiet city during the morning. Everyone seemed to sleep during the day and venture out at night for food and drinks. When I walked into Factory Girl!, I was greeted with more of the same. The place was practically empty making me question my decision to eat breakfast here. Hungry and tired from flying across the Atlantic the night before, I decided to give Factory Girl! a chance. It was a cold morning in Berlin, so I grabbed a table next to one of the big windows where the warm sun was shining through into the restaurant. 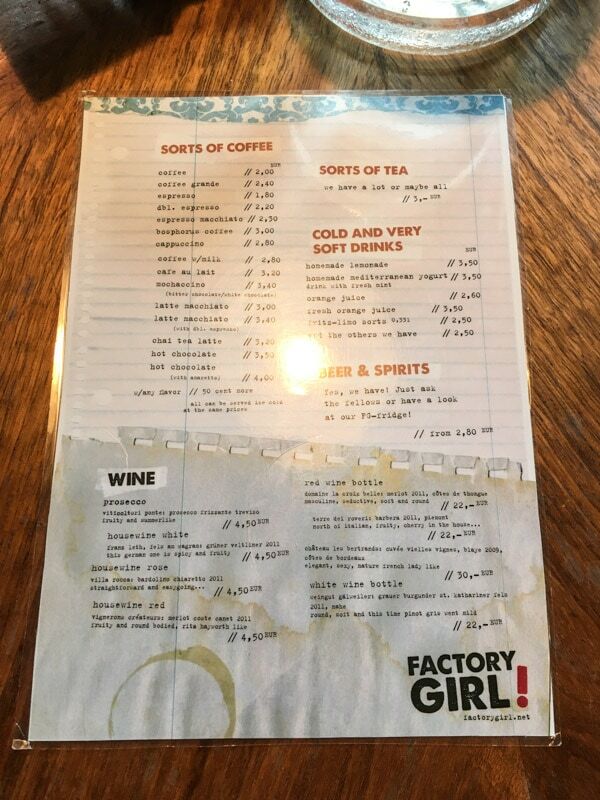 As you can see, the menu at Factory Girl! is quite simple with a small selection of breakfast items. If you are looking for your typical heavy breakfast items such as pancakes, waffles, or even Eggs Benedict, then you might want to find another breakfast option in the city. On the menu you will find simple egg dishes (scrambled or omelet style), sandwiches, toast, salads, and muesli. As for you drinks, you will find a large selection of coffee, tea, soft drinks, beer, wine, and spirits. On a hand drawn board was a separate sandwich menu. On my visit, I didn’t happen to try any of the fresh sandwiches, but their descriptions sounded great. I would definitely give them a try on my next visit. The decor of Factory Girl! is a little hard to explain. Playfully quaint and cute, cozy and rustic, industrial and elegant. If you are a hipster, artist, or just love boutique cafes, then you will enjoy the decor and ambiance along with the techno and electronic music playing lightly in the background. The design felt unorganized but in a good way. Wooden tables, benches, and chairs that didn’t seem to match were placed around the open dining room in no particular order. The best tables seemed to be near the large windows which allowed in lots of natural light. I was told that much of the furniture was second hand, which explained why I felt like I was sitting at a friends house and not at a cafe in Berlin. The front counter of Factory Girl! Complementing the cozy wooden tables were smooth, unfinished concrete walls along with worn red brick walls. Adorning the walls were unique postcards and posters. In a bin next to a table was an assortment of toys for kids, and the kids at heart, to play with. I usually don’t order hot chocolate (3,50 EUR), but since it was a cold winter day, I needed something warm. When the hot chocolate arrived, it consisted of two glasses. The first glass contained an extremely light and frothy cream topped with some powdered chocolate. The foam was so unbelievably light, almost like whipped cream but much lighter. In the smaller shot glass was the actual chocolate. This was a first for me as I dumped the chocolate shot into the creamy foam and mixed. The foam mixed with the chocolate was perfect. All hot chocolate drinks should be just like this. It was light and frothy while being slightly sweet and slightly bitter. Since I knew I wanted eggs for breakfast, I only had a few options. I decided to order the Cold Cuts “Egg Factory” (5,50 EUR). This dish with a funny name was made with three scrambled or omelette style eggs mixed with bacon or sucuk, a dry, spicy sausage from Turkey. When I made my order, the server didn’t ask if I wanted scrambled or omelette style eggs but I did tell her that I would like bacon. On the side was a delicious assortment of sliced warm homemade bread accompanied with butter. For such simple ingredients, I was superposed how colorful and fresh the egg dish looked. The scrambled eggs, served in a circular metal bowl on top of a wooden serving tray, was topped with fresh arugula, sliced cherry tomatoes, and a sweet balsamic reduction. Even without cheese, the eggs were fluffy, seasoned well, and cooked to perfection, which surprisingly is much harder than it seems. As mentioned before, when I made my order, I told the server that I would like bacon. For one reason or another, I did not get the bacon I asked for but instead, my eggs were served with sucuk or sujuk. To be honest, I had no idea what sucuk was. Turns out sucuk is a dry and spicy sausage that originates from Turkey. The small and smoky pieces of sucuk were sliced thin and reminded me of prosciutto. The small pieces of meat were smoky, salty, and delicious. I was definitely glad that the server made the mistake. Though simple, all the ingredients seemed to work well together. The fluffy eggs, the peppery and slightly bitter arugula, the smoky and salty sucuk, and the sweet and savory balsamic reduction all came together to make one delicious dish. When I walked into the restaurant on a Sunday morning, the place was almost empty. When the server finally approached my table, she handed me a menu and walked away without a smile or any sort of greeting. The server wasn’t rude but wasn’t friendly either. I had no problem with this, but it’s something you might want to know beforehand. Another issue with the service was that when I made my order, I was not asked what type of eggs I wanted and second, I ordered bacon and received something else (which turned out to be better). Finally, stickers on the front door stated that Factory Girl! accepted credit cards. When I handed my credit card to the server, she firmly said no, cash only. Maybe the credit card machines were down that day. Luckily, I had cash on me to pay my bill. For such a limited menu, I was surprised how delicious the egg dishes at Factory Girl! were, especially for using such few ingredients. The flavors of the scrambled egg dish had it all: salty, sweet, savory, and smoky. Though not rude, the service could have been a little more friendly and more accurate with orders. I was a big fan of the decor and ambiance of the restaurant. I loved the concrete and worn brick walls along with the second-hand tables and furniture that seemed to not match, but in a good way. I felt like I was sitting in the living room of a friends house instead of being at a restaurant. If I was in the Mitte area of Berlin again, I would definitely return to Factory Girl!.